Automation: We analyzed the data from several million lines of code to determine the most common causes of manual intervention, and, by making some strategic changes to the way the code is generated, managed to reduce the amount of both EWIs (Error, Warning and Information messages) and compilation errors significantly on large (>1 million Lines of Code), complex applications. Also, depending on the VB6 features used, the VBUC now automates the migration of even more smaller applications and components completely! New Features: The VBUC v3.0 also contains additional features, such as the migration of the IsMissing statement and increased support for additional third party components. We are also integrating the VBUC with brand new online documentation resources that should help you as you perform the migration! Code Quality: The Visual Basic Upgrade Companion always tries to generate high-quality code that looks as if it was originally written in .NET. This increases the maintainability of the migrated application, and allows developers joining the project at a later date to very quickly start working on the codebase. Because of the great differences between Visual Basic 6.0 and VB.NET/C#, however, achieving this goal is not always possible. For this release we continued increasing the quality of the migrated code, including minor refactorings to control structures, and adding things like support for translating additional error handling statements to try/catch statements. All of these was supported by some significant changes we did under the hood, which should make it easier to add new features in the future (including customer-specific customizations) and reduced the memory footprint significantly, while increasing migration speed. Watch this space for more details as the release date approaches! Enhanced resolution of default properties: By both improving the typing engine of the VBUC and generating additional code for runtime resolution of default properties, we were able to reduce the total amount of EWIs present in the code by 30%! IsMissing migration: We now correctly support the migration of the IsMissing statement. We are currently conducting a limited Beta program for the VBUC Developer Edition v3.0. If you are interested in participating, drop me a line and I’ll get back to you with further instructions. Edit: The upcoming version of the VBUC will be version 3.0 - this release represents a leap in the level of automation and additional features we managed to squeeze in, and thus deserved a new major version number. I will post additional details on the different features as the final release date approaches. Several times I’ve mentioned the Type Inference feature of the Visual Basic Upgrade Companion. The main objective of the component that we call the “Typer” was to eliminate Upgrade Issue 1037 (Couldn't resolve default property of object ‘x’) that appeared then the VBUC wasn’t able to correctly determine the data type of a variable and consequently couldn’t resolve its default property. Even though dealing with EWI 1037 was the design goal, having a typing mechanism in the VBUC allowed us to improve a great deal of transformations. One particular feature that benefitted from it was the migration of VB6 Enums. To illustrate this, let’s look at an example. C# Generation: The Visual Basic Upgrade Companion is able to generate C# directly from the Visual Basic 6.0 source code, as an alternative to Visual Basic .NET. Structured Error Handling: The Visual Basic Upgrade Companion includes features to remove unstructured “spaghetti” code and replace it with structured flow control statements in .NET. All unused labels are removed from the resulting code. Plus the most commonly used “On Error ” patterns are currently recognized and replaced by the tool. This is important for C# migrations, as it ONLY supports structured error handling. .NET Native Libraries: Instead of upgrading VB6 code using the Visual Basic Compatibility Libraries like the Upgrade Wizard does, the Visual Basic Upgrade Companion promotes the use of .NET native libraries whenever possible. Stub generation: To ease the compilation process, the Visual Basic Upgrade Companion generates an empty declaration (stub) in a stub-dedicated source code file and into the converted project for each library element which occurs in the original application and does not have an equivalent in .NET. All the references to these not-converted elements are translated into references to their corresponding stub declarations. This strategy does not fully resolve the lack of .NET equivalent elements, since the stubs will require manual implementation, but, it saves an important amount of time during the manual changes stage. Code quality enhancements: The VBUC generates higher quality code with more mature and exact transformations. These transformations include data type enhancements and grammar pattern transformations and detailed code improvements. A detailed explanation of these transformations can be found on the VBUC vs. UW page. Multi-Project Conversion: The Upgrade Wizard is able to convert one single VB6 project file (*.vbp) at a time. Hence, if the user wants to upgrade a complex VB6 application with this tool, several considerations must be taken in order to accomplish full functional equivalence. 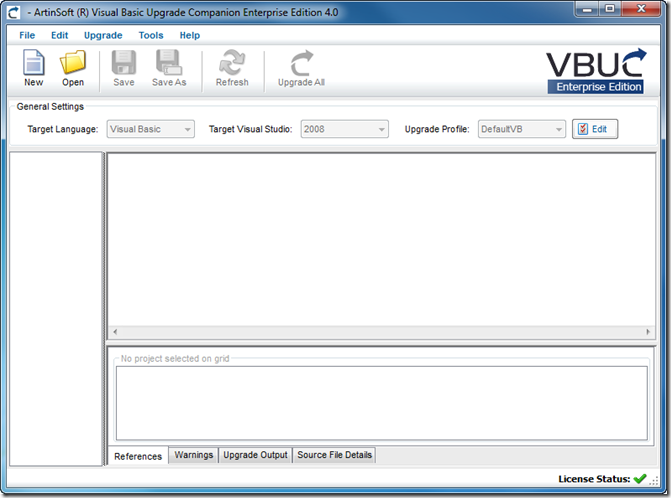 The Visual Basic Upgrade Companion allows the conversion of multiple Visual Basic 6.0 projects. It performs a separation between the pre-processing and migration stages in order to fix problems like the use of by-ref parameters, interfaces, renaming and typing among the different projects. The pre-processor environment solves the references among projects and simplifies the overall migration process. .NET Enumerations: Another important Visual Basic Upgrade Companion feature, absent in the Upgrade Wizard, is the replacement of numeric literals assigned to several control properties with .NET enumeration equivalents when possible, so that the generated Visual Basic .NET code is more legible and maintainable. 3rd Party Library Extensibility*: The VBUC can be customized to convert any third party library to its native .NET equivalent. It ships with support for several libraries out of the box, which are detailed in the VBUC vs. VBUW document. 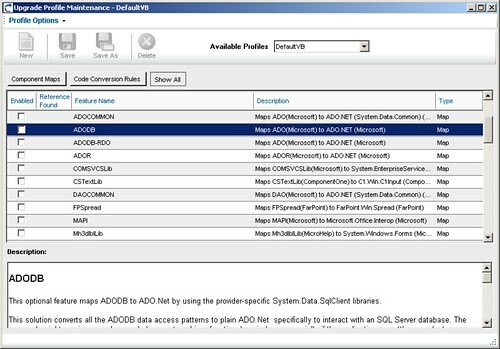 Legacy Data Access to NET*: The VBUC upgrades the legacy data access models (ADO, RDO, DAO, ADOR) to .NET equivalents, employing special transformation rules and helper classes (for some specific source/target combinations). On the other hand, the UW generates a target application that still uses those legacy data access models to communicate with the database via COM Interop wrapper calls. Custom Maps*: The Visual Basic Upgrade Companion Custom Maps extensibility, allows the user to upgrade their non-supported libraries and controls using a simple set of user-defined transformations. as using standard Naming Conventions for the .NET languages and recognizing conflictive user-declaration names to assign new denominations (including all of its references).These tasks improve the resulting source code readability and hasten the manual change stage. COM class exposure*: When this optional feature is enabled, the Visual Basic Upgrade Companion will generate attributes for the COM-exposed classes and their members, in order to keep the resulting assemblies exposed through a COM interface. This enables the resulting components to be called from other non-managed components via COM. 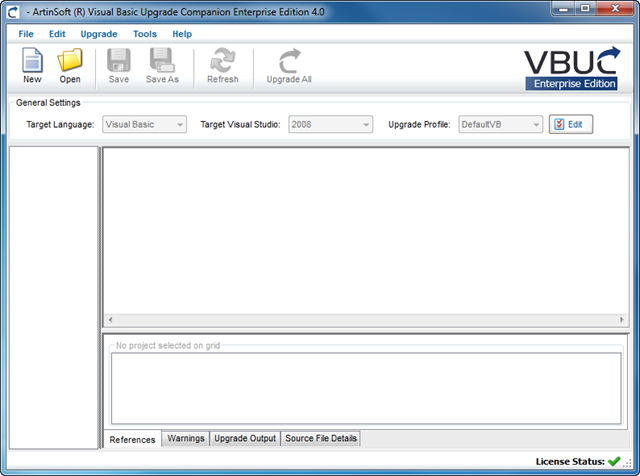 Make sure you download the PDF on the Visual Basic Upgrade Companion vs. Upgrade Wizard page for additional details. Items marked with * are ONLY available in the Visual Basic Upgrade Companion (VBUC), and are not available in the VBUC Developer Edition. One of the key features of the Visual Basic Upgrade Companion (one that is not present in the Developer Edition, BTW) is that it’s functionality can be customized and extended. By doing this, developers working on a migration can have the VBUC do as much of the work as possible for them, minimizing the manual work and producing a higher quality product that satisfy both the developer’s and end user’s expectations. Performing repetitive changes to, for example, replace the data access components from VB6 (ADO/RDO/DAO) with native .NET data access (ADO.NET), is better done by the VBUC at migration time. This also applies to particular programming patterns used by organizations that need to be replaced by .NET-native patterns, and to coding conventions that vary between VB6 and .NET languages. 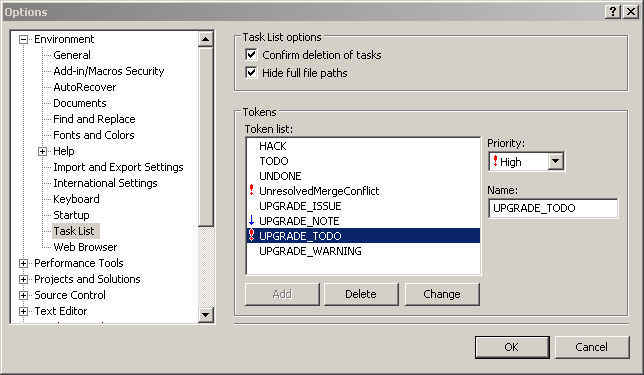 The Visual Basic Upgrade Companion includes three mechanisms to customize the generated code: Migration Profiles, Custom Maps and Additional Customizations. A new feature that was introduced in version 2.0 of the Visual Basic Upgrade Companion, it gives end users control over which features and transformations to use for a particular migration, by using the concept of Migration Profiles. These profiles provide two types of rules that can be switched on/off. The first type, Code Conversion Rules, that deal with patterns applied to the code, such as generating structure error handling (try…catch) from On Error…Goto statements or applying commonly used naming conventions to the code. The second type is called Component Maps, and deal with translations from from one ActiveX component, such as a status bar or a grid, to a native version of the component. The Visual Basic Upgrade Companion includes a “mapping” mechanism that allow end-users of the tool to define the transformation of one element of a library used in the VB6 code to a member of an assembly in .NET. This allows a migration team to identify and implement time-saving transformations, and, when combined with the implementation of an adapter for the .NET component, can speed up the migration process dramatically. These type of customizations require some modifications to the VBUC that can only be performed by ArtinSoft’s in-house team. It is a very valuable option that allows companies to get a an end product which furthers increases the return on investment from the migration. Jointly with the Visual Basic 6.0 migration campaign we are launching in the UK, today we released the Visual Basic Upgrade Companion Developer Edition. This is a scaled down version of the Visual Basic Upgrade Companion, targeted at individual developers that want to migrate their Visual Basic 6.0 applications as fast and painlessly as possible. It has a license that is valid for three months and allows you to migrate an application of up to 50,000 lines of code. The VBUC Developer Edition does have some fewer features than the fully-fledged Visual Basic Upgrade Companion. All the features that we decided to include in the Developer Edition, however, are targeted towards automating as much of the migration process as possible. So, we left out features that have been introduced by the request of our enterprise customers over the 7+ years the tool has been on the market (yep, we were already doing VB6 migrations before the official release of .NET - and it wasn't all fun with the Betas). We made it so that getting an application up and running in C# or VB.NET is as simple as possible. And, as an introductory offer, The VBUC Developer Edition will only cost £199 for a limited time. So why wait?